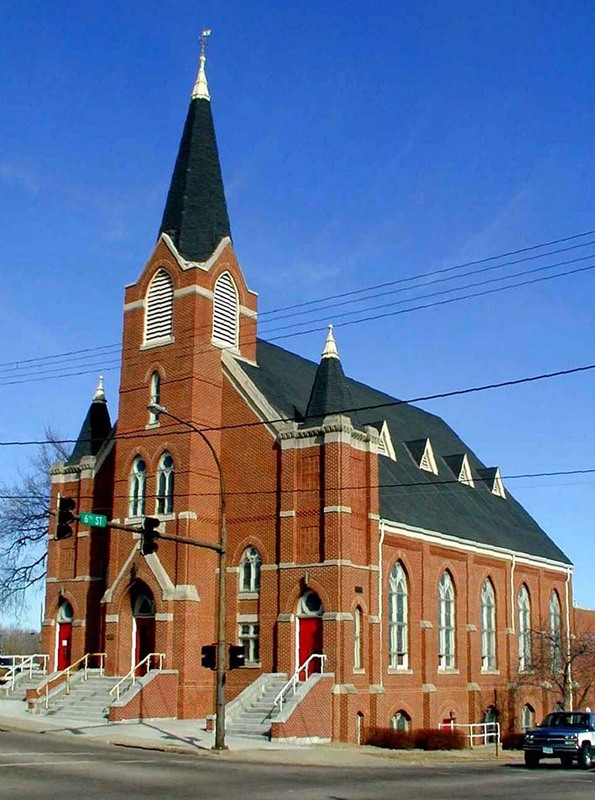 "The Red Brick Church on the Hill"
Augustana Lutheran Church's history includes three church buildings that cover its one-hundred-twenty-five years. Each of these places of worship have meant much in the lives of our many members. All have experienced worship, Sunday school, happiness, sadness, fellowship, baptisms, confirmations, marriages, and funerals. The following show exteriors and interiors of the three church buildings which have been part of our history. Augustana conducted its first service in May of 1875 in this rented school house (pictured at left) located at Third and Virginia Streets. A group of seventeen men and women and Pastor P.A. Pihlgren met May 17, 1875 to form the beginnings of our present church. Services were conducted here until the end of 1875 at which time the congregation moved to their own newly constructed church. The congregation had grown to 76 members in its first year. 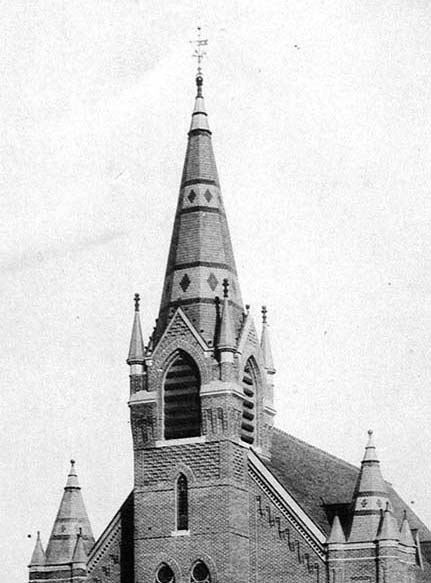 They wanted and needed a larger church building so this, the second church (pictured at right), was built at the southeast corner of Fifth and Virginia Streets at a cost of $1,400.00. A major addition was made to the church in 1882--an organ. This organ called the Moline organ, was built by Augustana church member Lars Moline. early in March 1887, the trustees of the church felt it was time to seek land in the immediate area for a third church. During the period from 1875 until the end of 1889 there were seventy young people confirmed and 281 babies baptized. 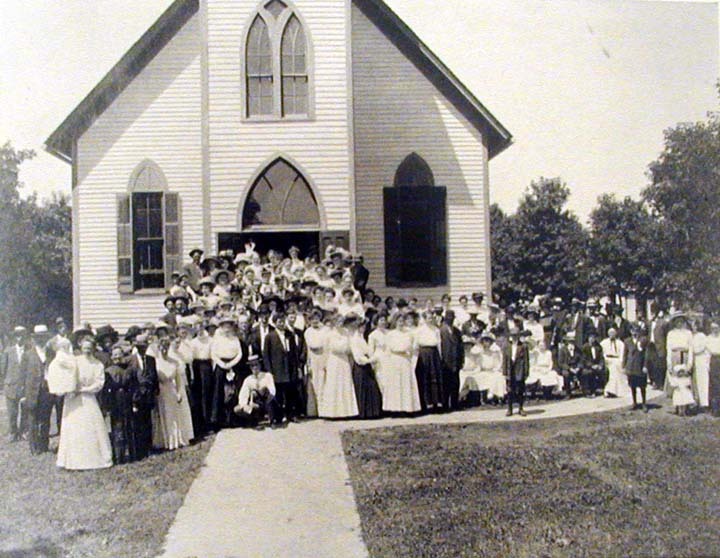 Time passed quickly and as the church grew in numbers, the members made plans for a new church. Two lots were purchased at the corner of 6th and Court Streets at a cost of $7,500, and the famous architect Charles P. Brown drew up plans for the new building. Brown was also the architect of the Krumman Block, 1101-1103 on Historic Fourth Street, just two blocks to the south in Sioux City. 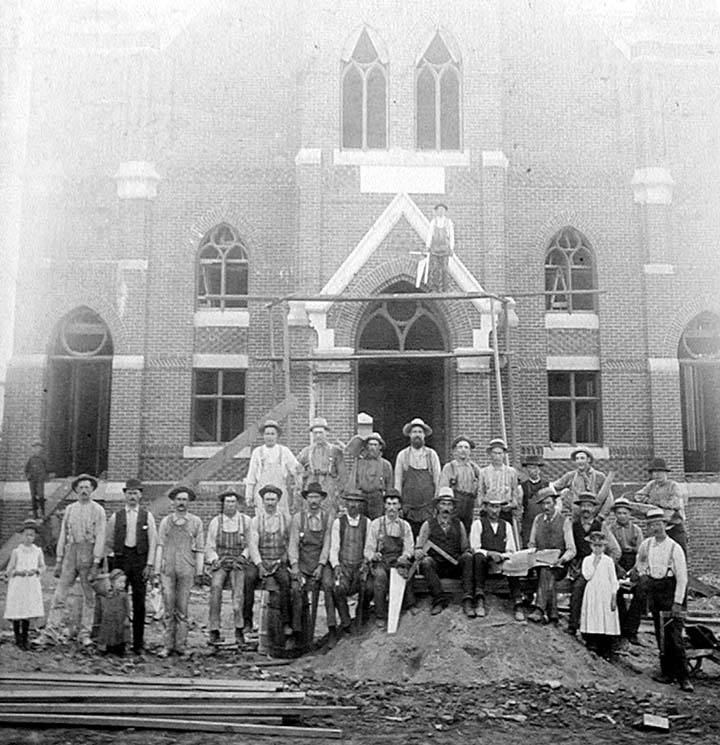 Construction on the new church began in 1889, with the final cost a whopping $35,000! Pictured at right is some of the construction crew working on the new church at 6th & Court. A close look at the picture shows workers with handsaws, framing squares, and other tools of the trade, and even a set of construction drawings. 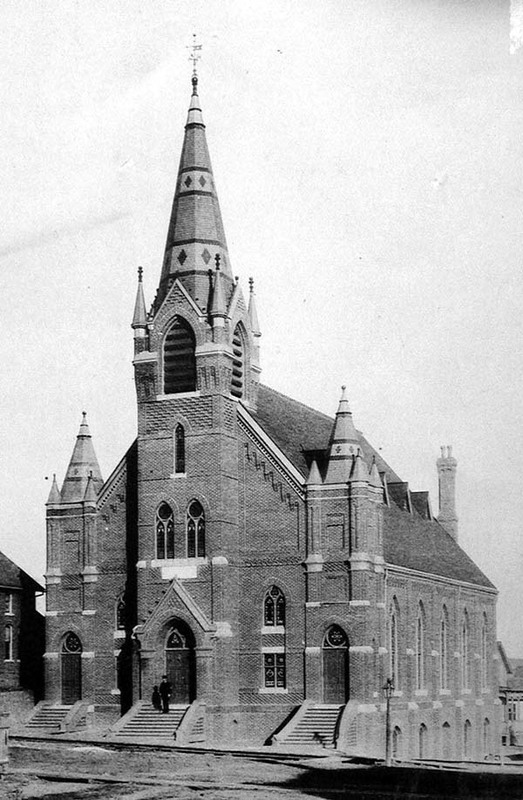 The construction of the third church was completed in just under one year and was ready for use in early 1890. 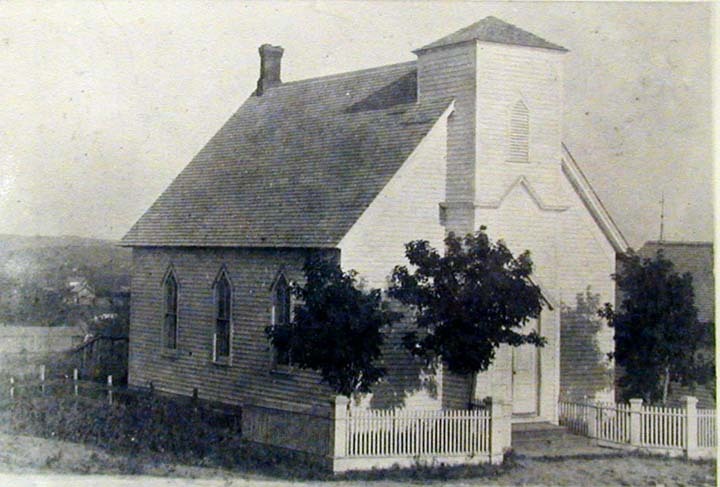 The church, as shown in this picture, was dedicated February 16, 1890 and has been used continuously to this date. The exterior today remains much as it did when it was first built 114 years ago. Notice, however, there were no paved streets, no electrical wires overhead, no stop signs at the corner and, of course, no automobiles. This is a closer view of the steeples of the third church. The original center steeple and two side steeples were covered with decorative colored wooden shingles. Each of the three steeples was surrounded with four turrets. The steeples, as you can see, presented a very impressive view of our church. The four turrets, at each corner of the three steeples, were removed sometime later because of developing water problems. If you were seated in the upper back balcony on a 1907 Sunday morning, this, "The 1907 Interior View", is how our church would have appeared at that time. Notice the iron railing extending across the front of the church. Observe the beautiful fresco painting between the pillars and in the chancel. Also note the writing inscribed on the banner in the arch above the organ. The painted banner, although not readable in the picture, is translated from Swedish and reads from the left side "The Lord is in His holy temple": Psalms 11:4 and to the right "We preach the crucified Christ": 1 Corinthians 1:23. The Schuelke organ (left), shown in the back of the chancel, was the second of four organs used in Augustana's history. The first, the Moline organ, was used from 1882 until 1887 when it was replaced by the Schuelke. The Schuelke organ was replace in 1919 by the Bennett organ. 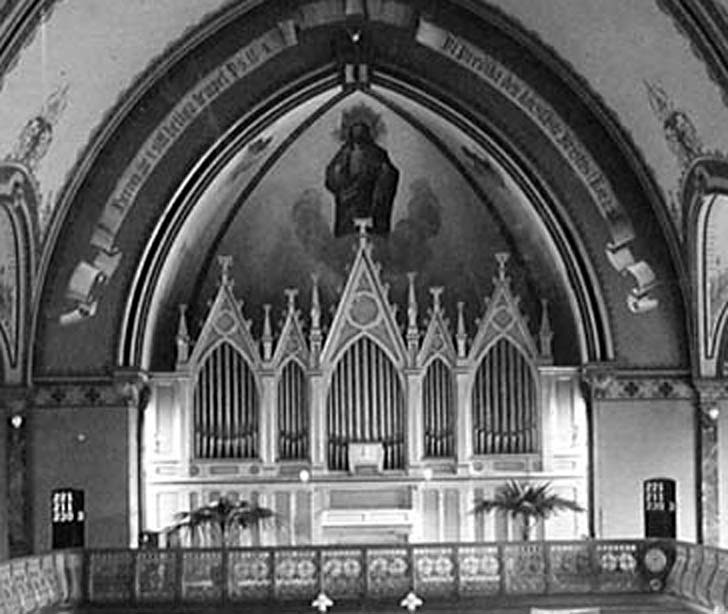 It was in 1919, when the Bennett was installed that the location of the organ was relocated to the rear of the church. Our present organ, a Moeller installed in 1958, has been in use ever since. 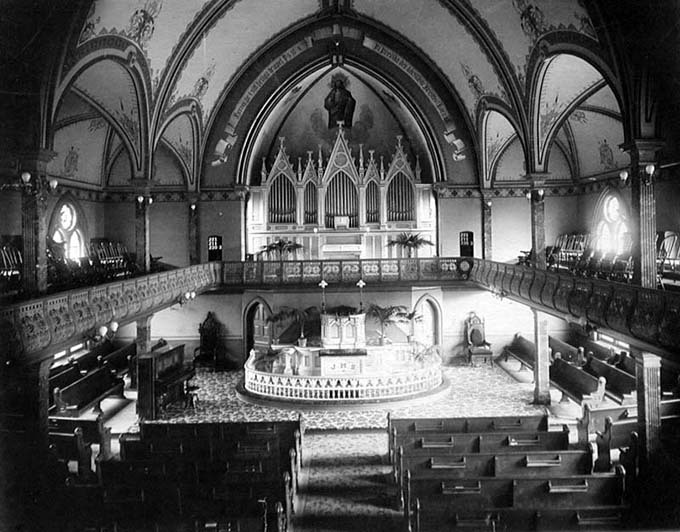 The "Altar of Peace" was part of a major change to the interior of the church in 1919. 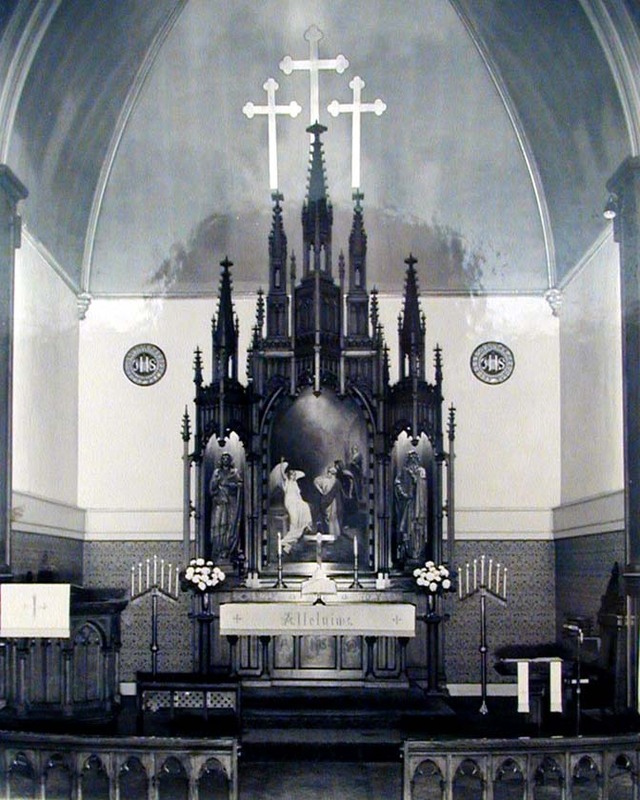 The gothic style altar was carved by German World War I prisoners held in the United States during the war. Other parts of this change included moving the organ to the rear of the church, removing the front balcony iron rail, a new pulpit and gothic style communion rail and repainting of the nave by a fresco artist and interior decorator. 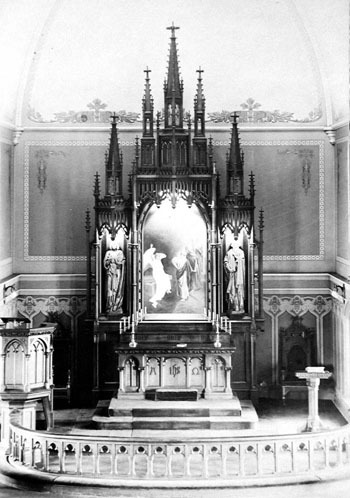 The Augustana Chancel of 1955 still uses most of the appointments of the chancel of 1919 "Altar of Peace". The altar chairs were moved to the sized--much as you see them today. The communion rail had been opened in the center in 1942 to allow access to the chancel from the front. A more noticeable change in this 1955 picture was the decorative paining in the chancel. Of special interest and beauty are the three crosses directly above the three center spires of the "Altar of Peace". The 1970 interior view of Augustana shows the extensive changes made to Augustana during that year. 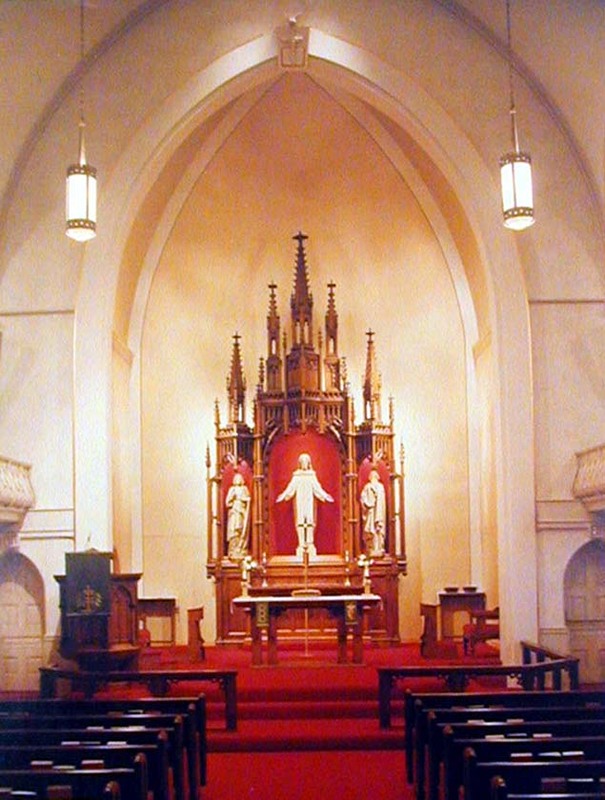 The statue of Christ replaced the "He Is Risen" painting, shown in a previous picture and was in the center of the "Altar of Peace", the communion rail was replaced, a free standing altar facing the congregation was added, new pews replaced the old and new light fixtures were put in place. Not shown in this picture was the separation of the church nave from the narthex by a glass and wooden partition. Augustana today stands much the same as Augustana stood at its dedication February 26, 1890. There are some differences however--a new layer of bricks on its exterior, a paved street at the front and side, an automobile in view, electrical wires and telephone poles above the streets and a traffic signal at the corner. But this is no mistaking, its the same Augustana of 1890. With our continuing worship here, our care and our dedication, Augustana will be here for the 225th anniversary celebration 100 years from now.